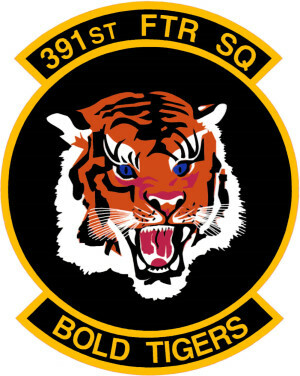 The 391 FS “Bold Tigers” is the largest fighter squadron in the USAF, comprised of 86 Airmen and 24 F-15E aircraft. The squadron is part of the 366th OG and the 2nd USAF manned F-15E strike Eagle squadron in Mountain Home AFB , ID. 391st FS started their history in 1943 flying P-47 thunderbolts. Post WW2 sees the unit flying F-51 ( P-51), F-84, F-86, F-100 in the 1950s. In 1963 she took on the brand new F-4C Phantom II. The Unit was deployed in Vietnam and later task in defending airspace of Japan and Republic of Korea. They switched their role to tactical bombers when they the unit was further transform to the F-111. Finally in 1992, Bold Tigers is again transformed into the current designation of flying ” F-15E Strike Eagle “. They currently flies the newer F-15E using the PW-F-100-229 engine. As you can see from the list of aircraft below mostly built in 1990 and 1991 compared to her sister squadron Tbolts using aircraft of built in the late 80s. This engine as we have discussed in our Article on the T bolts is an upgraded engine from the original PW-F100-220 and generally have a 20% increase in performance. when visiting the 391st in Nellis AFB, all aircraft carried the LANTIRN Navigation pod on the starboard side and the Sniper XR pod on the port side. The Sniper pod have since replaces the older AN/AAQ-14 targeting pod. We have also spot both the Tigers and Tbolts carrying the AN/ASQ-236 Radar Pod (or recce pod). This is an externally mounted sensor unit which is carried on the center-line pylon. It contains synthetic aperture radar that provides detailed maps for surveillance, coordinate generation and bomb impact assessment purposes. So far in Red Flag 15-3 we see these F-15E carry AIm-120, AIM-9M , gas bags, and LGB and Jdam configurations. On Red Flag 15-3, we were able to visit the 391st both on the ramp and also on the runway. These are the Action shots we got seeing this unit in actions.